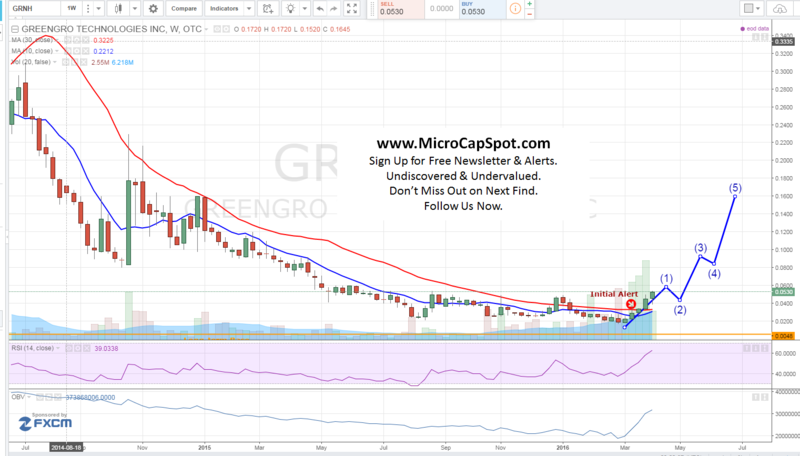 Greengro Technologies Inc (OTCMKTS:GRNH) continues to advance locking in gains of 13% on the day and over 150% since our initial alert that GRNH was poised to triple. Volume surged to over 21 million shares trading hands, 4 times higher than its daily average. The company continues to make headway after several recent developments. In late March, GRNH announced that iGot420 had received final clearance to begin selling its project. This has pathed the way for GRNH to see significant sales of equipment and supplies to the company. It is projected to bring immediate revenues of up to $2.5 million in equipment and supply revenues to be used in the first phase. This is just the beginning as the legal marijuana industry continues to pick up pace and acceptance around the USA. The company recently posted record earnings. In recent developments, Greengro Technologies Inc (OTCMKTS:GRNH) announced a record breaking quarter with sales increasing 242% to $0.522 million for the first quarter 2016 compared to $0.152 million for the first quarter 2015. The exponential and explosive growth in sales is due to new customers, expansion of product lines, and renewals. GRNH has been benefiting from the rapidly growing industry of legalized marijuana. The industry is expected to reach $44 billion by 2020. In addition to the explosive growth, the CEO pointed out that the exponential growth is not an anomaly but a trend. From the fourth quarter 2015 to the first quarter 2016 revenues soared 209%. The CEO of GRNH hinted that the sales increase may be even more impressive with a good close out for March. In other developments, GRNH announced that it had launched a medical marijuana dispansery website to help customers find dispensaries in the area. No app is required for the innovative technology that GRNH developed. The website is 420scan.com. There is no app or sign up needed. Users of 420Scan can receive notifications when their favorite dispensaries update their menu or add new deals. Greengro Technologies Inc (OTCMKTS:GRNH) is into both indoor and outdoor aquaponics and hydroponic systems and grow rooms. The company’s customers include restaurants, community gardens, and small and large-scale commercial clients. It also provides design, construction and maintenance services to grow and cultivation operations and collectives in the medical and recreational marijuana sectors. GRNH is currently trading at a $18 million market valuation. GRNH announced first phase of revenue with an affiliate company. The company had a record breaking quarter and is in the early stages of turning around. Revenues will likely continue to expand and year over year comparable will likely be impressive. This is an exciting story that is about to take off. Stay tuned for more details. We will be updating on GRNH when more details emerge so make sure you are subscribed to Microcapspot so you know what’s going on with GRNH. Disclosure: we hold no position in GRNH either long or short at the publication of this article and we have not been compensated for this article.